If it seems fates are against you today, they probably are. Isn't this supposed to be a positivity blog? I have to admit, when I opened this cookie the other night, I was a little mad that I'd gotten it. I didn't want to post about it. I thought it was "too negative" and wondered about the manufacturer letting something like get into a fortune cookie. But then I realized that I was just playing into a story that some slip of paper wedged into a crispy, delicious, baked novelty was saying and I was taking that story WAY too literally, so I stopped with all that and instead got thinking about "How can this cookie possibly disrupt negativity?" Well...let me break it down here. What we THINK is going on ISN'T ALWAYS what is going on. If you "think" the fates are against you, they always will be, but we can change how we think. If it "seems" the fates are against you—then change your fate. Things aren't always as they seem. Our inner monologue will directly affect our outlook, perception, and experience. In order to have the result we want, we need to CHANGE our inner story, CHANGE what we're telling ourselves, and not play into a negative mindset. It is so easy to just slide into a "woe is me" about a situation sometimes, but it doesn't have to be that way. What's the worst thing that can happen if you choose your reaction to something instead of just reacting? If you choose to smile when you're sad? If you choose to reach out to a friend when you're hurting? If you choose to take even one step in the direction of bettering yourself? Yeah, I know, feelings are normal. Look, I'm not perfect. I get negative feelings, too. It's normal to feel them. To suppress them wouldn't be ideal, and you can't simplify this to one blog post, wave a magic wand, and say "All better now!" So go ahead: feel them...and then choose to move past them and put your wishes out there into the world to feel better, to feel empowered, to feel like you can do something about a situation—whatever the case may be, where you're feeling like the fates, the world, the universe—whatever—is against you. You might be surprised at how the fates suddenly align when you align your thoughts. So, I mentioned that this cookie made me mad, initially, but now, I like it! I think it's a good reminder to us all to keep our thoughts square with how we want our lives to be. 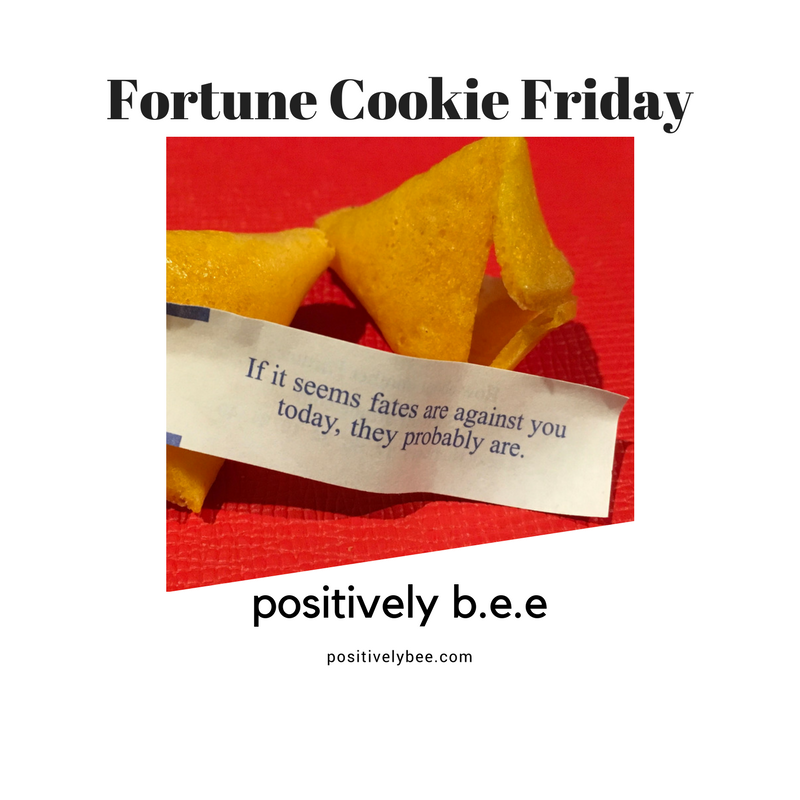 If you want to have your fortune cookie featured on positively b.e.e., send me a message through Facebook with a photo. Want some fortune cookies of your own? You can order them here! Affiliate links help positively b.e.e. at no extra cost to you. If you're looking for a new backpack, I love Fjallraven's stuff! Here's one that I like. I have to agree. What we THINK is going on ISN'T ALWAYS what is going on. Sometimes it's all in the mind. Our actions speak louder than words and thoughts in our minds.